Skyfall is a great film but you could argue that isn’t a great Bond film. Casino Royale put the James Bond franchise back on track, Quantum of Solace managed to end that chapter in the Bond series so it should be down to Skyfall to start to rebuild and reintroduce the Bond character we have become so familiar with over 50 years and 22 films. Skyfall does begin to reintroduce some of the classic James Bond elements but does so at the expense of others. For example, the Bond theme returns, as does the catchphrase, the tuxedo and the drink. Unfortunately, this replaces effective and influential Bond Girls. Naomie Harris fills that role in some ways, playing an integral part in the action sequence that opens the movie and then being a key presence throughout but knowing how her role develops, she isn’t really a “Bond Girl.” This means the role is left to Berenice Marlohe as Severine. Again, she plays a role but is used as an introduction for the villain and has very little lasting impact in overall film itself. Using the Bond Girl to prove the ruthlessness of the villain is a good idea though and we get the best villain that Daniel Craig’s Bond has faced so far. Javier Bardem clearly knows how to play a Bond villain, being just twisted and evil enough to be effective without being silly and over-the-top. His scenes opposite Judi Dench’s M effectively replicated Hannibal Lecter in Silence of the Lambs and demonstrated how much of a threat Silva really is. Judi Dench actually has a much more integral part in the story. 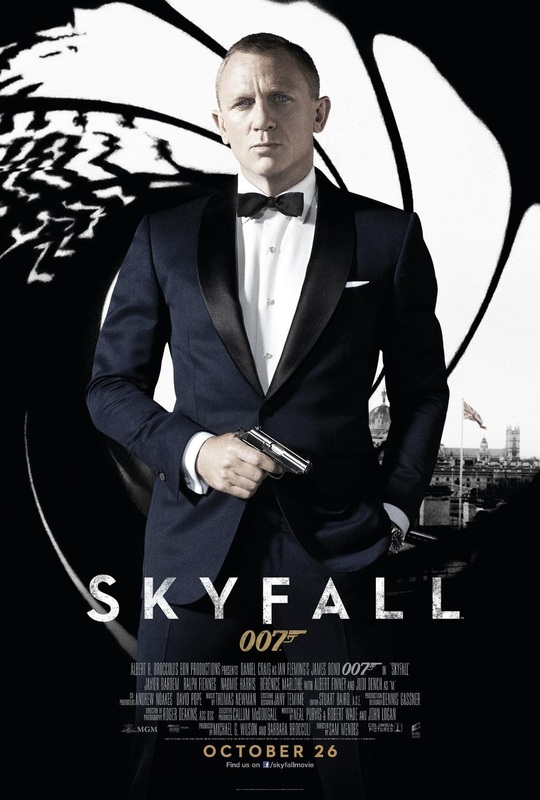 Skyfall was released in the 50th anniversary of the James Bond franchise and does a good job of glancing at the past. There are more obvious references, like using Sean Connery’s Aston Martin, but also subtle, reflective points too, like referring to the advancing age of the spy and is effectiveness in a more technology based age (highlighted by a newer, younger and more tech-savvy Q played by Ben Whishaw). It is also the biggest flaw in the movie. There are some great action sequences, the highlight probably being the tube-train crash but the final act is a “James Bond-Home Alone” mash-up where we are taken back to the literal family home of 007 and Bond, M and a random Albert Finney (a part that should have clearly been given to Sean Connery) fend off an army of henchmen. It is very exciting and makes for a good action set-piece but doesn’t feel like Bond. Sam Mendes has delivered a much better, coherent and significant Bond film but in taking away the more key elements of the James Bond franchise, he leaves a decent spy film that references the iconic character rather than stars him completely. The fact that it ends with a set-up much more in-line with what we recognise fills me with some hope and it could mean that Spectre (a well-known Bond feature in itself) could be more in-line with what has gone before. Overall, Skyfall carries on the Daniel Craig tradition of a more mature, gritty and serious James Bond. It has a great villain for Bond to fight, some decent action sequences and a reinstatement of the more traditional Bond tropes. Unfortunately, a lack of a proper Bond Girl and a huge nod to the past make this movie feel less like an actual Bond film and more like a homage to one. I watched it recently and still liked it. However, Casino Royale still rocked for me. Nice review. Thanks. I agree, Casino is probably Craig’s best.